Liv Spencer has written Navigating the Shadow World which " takes readers deep into the rich universe of Cassandra Clare’s New York Times–bestselling Shadowhunter Chronicles. With intelligent but accessible explorations of each volume of the Mortal Instruments and Infernal Devices series, Liv Spencer delivers the next best thing to a Shadowhunter’s Codex with commentary on the books as well as the references to folklore, legends, and literature. Spencer also recounts Cassandra Clare’s publishing story, from journalist and fan fiction writer to superstar author; explores the cast and crew who brought the first book to life in the film The Mortal Instruments: City of Bones, premiering August 2013; and delves into the TMI fandom, a passionate community that is anything but mundane. From the Claveto Chairman Meow, demon pox to dastardly ducks, Navigating the Shadow World is your very own insight rune." We've asked Liv Spencer: what sets Navigating the Shadow World apart from the other guides (i.e. 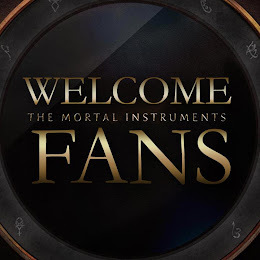 The Shadowhunter's Guide, The Official Illustrated Movie Companion, etc.)? Liv Spencer: I think the thing that really sets Navigating the Shadow World is that its heart is in the book series — each book in The Mortal Instruments and The Infernal Devices gets an extensive part devoted to it, where we dive deep into the characters, literary and cultural references, and mythology. (Boy did we get to know our demonology — and our angels — doing research for this book!) Navigating the Shadow World also gives readers info on Cassie's story, the making-of the movie, the cast's biographies, and details on the fandom. We really wanted it to be an exhaustive and complete look at what makes fans worldwide love the Shadowhunter Chronicles so deeply and loyally. I think it's a different perspective on the series than some of the other books. You can get The Shadow World Book Club: Companion also by Liv Spencer for free! Visit ECW Press for the PDF and/or ePub version and visit iTunes for the Apple iBookstore. A curated selection of the poems, plays, and works of fiction that Cassandra Clare quotes from in the Shadowhunter Chronicles. Liv Spencer highlights the specific text used in each volume of The Mortal Instruments and The Infernal Devices in this companion reader to Navigating the Shadow World. With selections from Hamlet, A Tale of Two Cities, Tennyson, Dante, and many more! For more information visit Liv Spencer's site.